Excellent information throughout the booking process really impressed thank you. efficient and courteous service as expected. very helpful and friendly as before.Replied promptly. We wanted a change to the published itinerary and Karen was great in sorting it out for us. Changes and prices agreed all on the same day. Polite, efficient staff. Phones answered promptly, staff eager to give you the best possible deals. When they say " we'll find out and ring you back shortly" that's exactly what they do ! Trace the intricate pattern of Europe’s waterways with Scenic, as postcard scenery and riverbank communities create a natural slideshow. Scenic offer the most inclusive river cruises in Europe, going to the Nth Degree to provide exclusive and authentic experiences, combined with award-winning excursions, to take you deep into the heart of every destination you visit. All of this, as well as an uncompromising signature all-inclusive service, confirms that Scenic really is the only way to cruise the incredible rivers of Europe. The university town of Regensburg’s well-preserved medieval structures include a twelfth century stone bridge with sixteen arches and a thirteenth century twin-spired cathedral. Built in 2015 and 2016 to join our European fleet the Scenic Jasper, Opal and Amber are the latest generation of Space-Ships, complete with vitality pool, sun deck and a range of exclusive dining venues. Every Scenic European river cruise begins aboard one of our boutique vessels or custom-built Space-Ships, so named for their spacious guest cabins, dining, and entertaining areas. Each of these four-deck Scenic Space-Ships includes numerous dining and sightseeing areas, as well as a lounge and bar area that offers panoramic views. Additionally, guests can soak up the rays at the Sun Deck swimming pool or retreat to the wellness center, which is equipped with a fitness area, beauty salon, and massage rooms. These ships are noteworthy for their luxury suites, which are outfitted with sun lounges, 32-inch high-definition TVs, and complimentary wireless internet access. The newest members of the Scenic Space-Ship dynasty; Scenic Jasper, Opal and Amber afford ground-breaking levels of comfort, safety and luxury for the 169 guests they’re capable of transporting on Europe’s celebrated passageways. Representing the pinnacle in luxury river cruising, Scenic Jasper, Opal and Amber are among the most spacious and technologically advanced vessels in Europe. Spread over four lavish decks, including the Sun Deck, Diamond Deck, Sapphire Deck and Jewel Deck; guests will relish every moment spent cruising Europe’s waterways aboard these majestic vessels. Each of these sister vessels have been fastidiously designed and crafted with your enjoyment and comfort in mind, so you’re guaranteed an unforgettable voyage. Boasting a roster of pioneering technologies designed to maximize the guest experience, as well as all of the lavish extras which have come to define our fleet of luxury 5-star Space-Ships; Scenic Jasper, Opal and Amber represent the precedent of luxury river cruising on Europe’s esteemed waterways. Terms and conditions: Fares are per person based on two adults sharing a suite. Offers advertised are subject to availability at the time of booking. Fares advertised may increase or be withdrawn at any time. Booking conditions of Scenic and Reader Offers Limited Agency Terms of Business apply. Offers advertised apply to new bookings only. All drinks are included on board except for a very small number of rare, fine and vintage wines, champagnes and spirits. WiFi service cannot be guaranteed and is subject to the cruise lines terms and conditions. Flights are based on London departures; regional flights may be available, may come at a supplement and may require an overnight stay at an extra cost. Please note some flights may be indirect. Eurostar options may operate indirect and require a change of stations, subject to availability, transfers not included. Porterage is not included on flight or rail. Meals as stated Breakfast (B), Lunch (L), Dinner (D). Private overseas transfers are for Royal Panorama suite guests and are available in selected airports only. Savings are based on two adults sharing a suite and is based on the difference between the Reader Offers Ltd standard fare and the current selling fare. Tours are subject to change, are non-transferable and may not be suitable for guests with mobility restrictions. Normal Cruise Miles terms and conditions apply. E&OE. 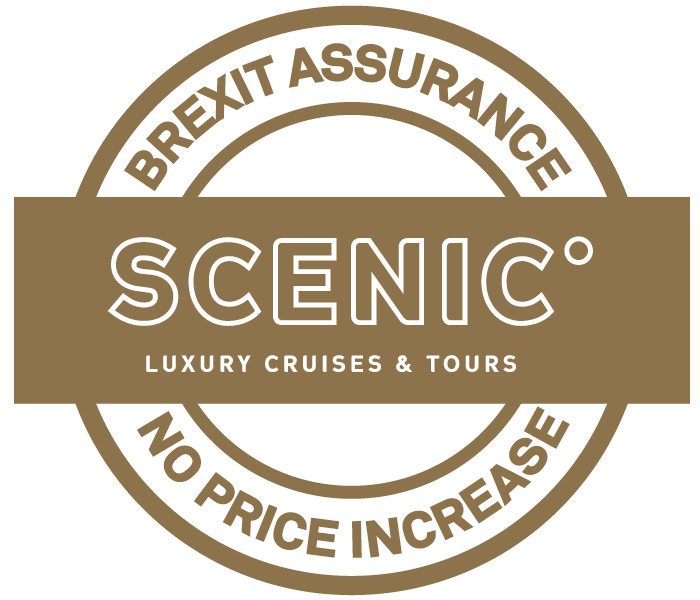 Scenic guarantee no price increase or surcharges on our advertised Scenic cruises or tour prices when booked before 29th March 2019. Scenic reserve the right to withdraw our offers at any time.